effort to lift the plane from the lake. — Gilbert R. Boucher II/Staff Photographer. 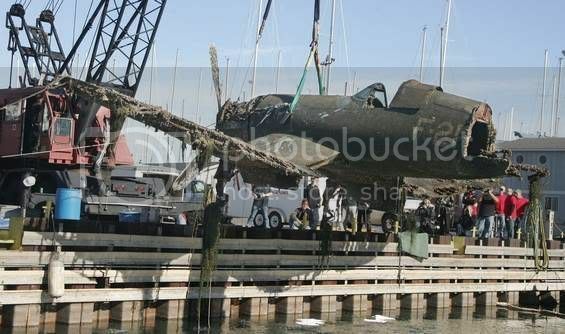 AS A WORLD WAR II-ERA FIGHTER PLANE was gingerly lifted out of Lake Michigan on Monday morning, the crowd gathered at Waukegan Harbor marveled at the aircraft's condition. Although under water since a 1943 training crash, the F4U-1 Corsair was remarkably complete. The tail section had broken away, but the remaining fuselage was in one piece. The distinctive bent wings still held some of their color, the propeller remained attached to the nose, and the gauges and pedals in the single-seat cockpit were intact. Even the landing gear was whole, although the tires upon which the plane once rested had long since disappeared. The Corsair was the latest wartime plane to be pulled from Lake Michigan for restoration. It wound up in the water, along with so many other aircraft, because the Navy flew training missions over the lake during the war from the Glenview Naval Air Station. About 80 planes remain in the lake from that era, Lyssenko said. This particular airplane went down on June 12, 1943, when its pilot, Ensign Carl H. Johnson, unsuccessfully tried to land on the USS Wolverine, a steamship that had been converted into an aircraft carrier for Navy pilots to practice takeoffs and landings. 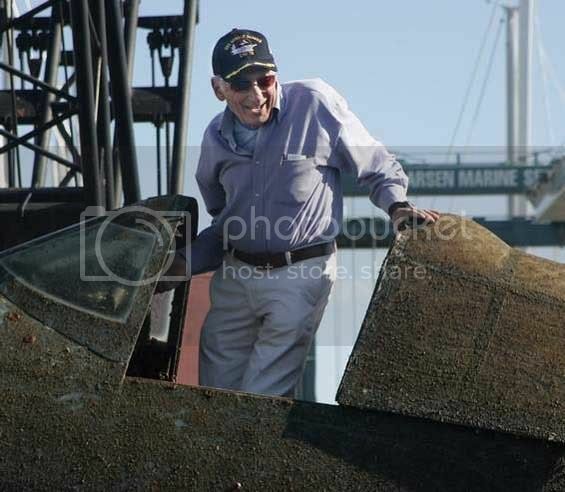 Johnson survived the crash but died later that year during a training exercise in Hawaii, according to research by Mark Sheppard, an aviation enthusiast from Oxford, England, who came to Waukegan to witness the Corsair's recovery. “It's fascinating, really,” Sheppard said when asked why he traveled across the Atlantic for the event. of the Corsair from Lake Michigan. — Gilbert R. Boucher II/Staff Photographer. Formerly based in Chicago, A&T Recovery has pulled more than 30 aircraft from Lake Michigan. The Corsair was recovered thanks to civilian funding. Mettawa resident Chuck Greenhill, himself a pilot and a military veteran, put up the cash for the project. “I saw these things and fell in love with them,” Greenhill said. Greenhill owns several World War II-era military airplanes, but this one isn't going into his collection. Still the property of the U.S. Navy, it's headed for the National Naval Aviation Museum in Pensacola, Fla., where it will be restored. After it crashed, the Corsair came to rest in 240 feet of water, about 10 miles from shore, Greenhill said. Ahead of Monday's event, workers brought the aircraft to the surface with air bags and towed it to Larsen Marine, where the recovery took place. 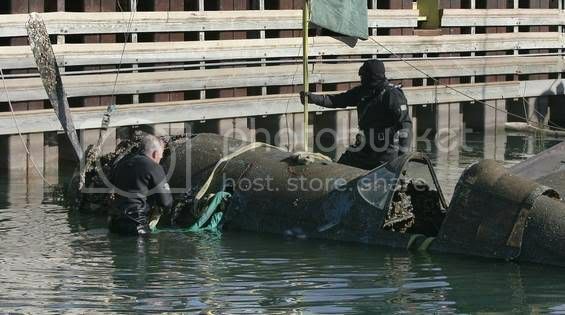 Using a large crane, divers and other manpower, workers took about one hour to raise the 8,000-pound Corsair out of the water and onto a waiting blue tarp. Crews had to stop every few feet to let water drain out of the airplane, a maneuver that reduced its weight. 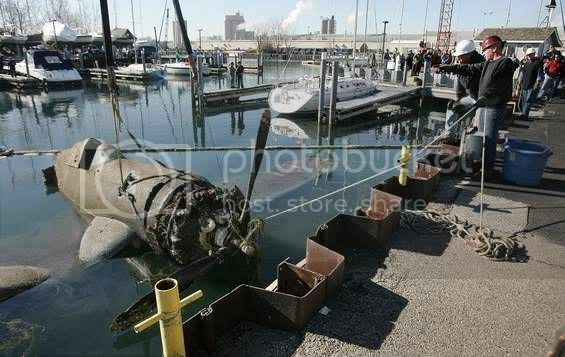 At one point the plane had to be put back into the water because a sharp edge cut the sling holding it. into the lake during training exercises in 1943. — Gilbert R. Boucher II/Staff Photographer. The Corsair will be disassembled and driven by truck to the naval museum. It will take years and millions of dollars to restore the plane, Greenhill said. But he believes it's worth the effort. Among the onlookers Monday was U.S. Navy Petty Officer First Class Eric Oldham, who brought his wife and four children to the event. A history buff, Oldham said he wanted to share the experience with his family. U.S. Navy Capt. Mark Wegge, director of training and readiness for Navy Region Midwest, watched the Corsair lifted out of the water, too. Classic Fighters Airshow in Blenheim during Easter. — BEN CURRAN/The Marlborough Express. A VINTAGE Ferrari of the skies is being reassembled at Omaka Aviation Heritage Centre at Blenheim. The Focke Wulf Fw190 should be airworthy and ready to face off against its rival, the Supermarine Spitfire, at the Classic Fighters Airshow at Omaka Airfield during Easter weekend. The Fw190 was a Luftwaffe workhorse fighter introduced in 1941 and used over France and Russia. The Spitfire, flown by the Royal Air Force, was the only aircraft to be a frontline fighter from the outbreak of the war to its conclusion in 1945. 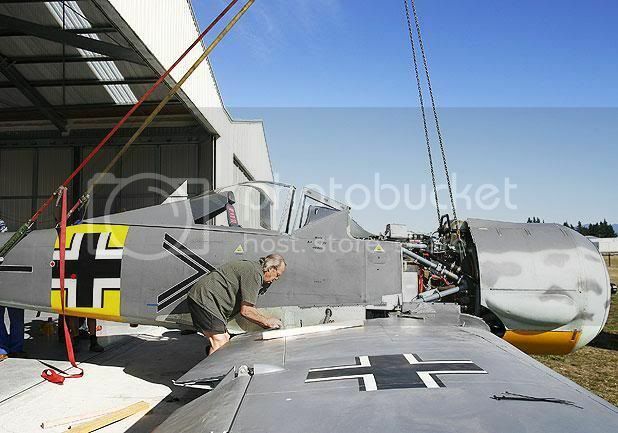 Airshow organiser Graham Orphan said the Fw190 arrived in Marlborough on Tuesday fresh off a boat from Germany and will be the only one of its kind flying in the southern hemisphere. The Fw190 in Blenheim will be based at Omaka indefinitely and is owned by an African-based Kiwi. The Fw190 was introduced operationally over France in August 1941. This model is a replica, built in Germany, and when it took to the air in 2004 it was the first time a Fw190 had flown since the end of World War II. The plane was then disassembled and several copies made. It was put back together during the past two years and as soon as it was finished it was packed up and sent to Omaka. "We're thrilled to bits; any time you're getting something transported around the world you're dealing with vagaries, delays of shipping and with things not going to plan. "If it was any closer to Easter we'd be chewing our fingernails pretty badly." An Auckland pilot was keen to get in the cockpit as soon as it was given the tick to fly by the Civil Aviation Authority, he said. "He's fizzing to get himself into this thing. "Most of the aircraft we operate are like Corollas through to Commodores — something like this is really a Ferrari, so any pilot worth his salt would want to get his backside into one." The Fw190 will be accompanied at the airshow by two Spitfires — the first time two will take to the sky at the show. A small British company with a dream of building a re-usable space plane has won an important endorsement from the European Space Agency (ESA) after completing key tests on its novel engine technology. Reaction Engines Ltd believes its Sabre engine, which would operate like a jet engine in the atmosphere and a rocket in space, could displace rockets for space access and transform air travel by bringing any destination on Earth to no more than four hours away. "Life might not be the party you were expecting, but you're here now, so you may as well get up and dance"
Tamaki Drive at 1117 am and sunk almost immediately. Life is not a journey to the grave with the intention of arriving safely in a pretty and well preserved body. Please note: IMHO and e&oe apply to all my posts.